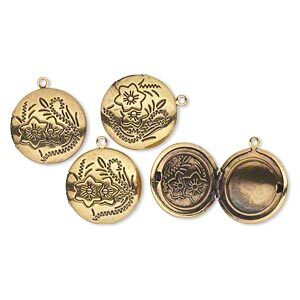 Drop, antiqued gold-finished "pewter" (zinc-based alloy), 20mm puffed flat round locket with flower design. Sold per pkg of 4. Drop, gold-finished "pewter" (zinc-based alloy), 29x23mm oval locket with acorn design. Sold individually. 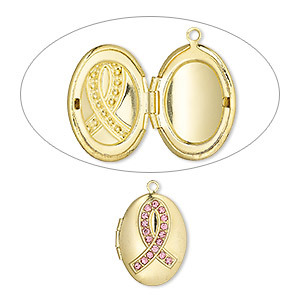 Drop, glass rhinestone and gold-finished brass, pink, 21x16mm oval locket with awareness ribbon and 14x10mm oval setting. Sold individually. 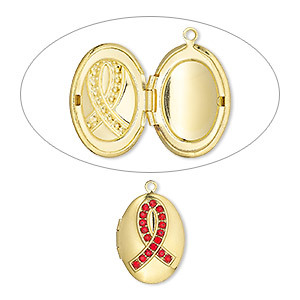 Drop, glass rhinestone and gold-finished brass, red, 21x16mm oval locket with awareness ribbon and 14x10mm oval setting. Sold individually. 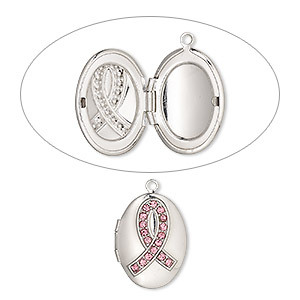 Drop, glass rhinestone and imitation rhodium-plated brass, pink, 21x16mm oval locket with awareness ribbon and 14x10mm oval setting. Sold individually. Drop, glass rhinestone and imitation rhodium-plated brass, red, 21x16mm oval locket with awareness ribbon and 14x10mm oval setting. Sold individually.